I recently read a USA Today article about East Haven Connecticut Police Chief Leonard Gallo being suspended for “waging a campaign against Latino residents that included beatings, false arrest and harassment.” It is important to note that this happened in a town where Mayor Joseph Maturo Jr. recently quipped that he “might have tacos” as a way of supporting the Latino community. Pick your jaw up. I’m not saying the mayor and chief are racist but do I need to tell you it’s hot when the thermostat reads 100? These comments and practices are reflective of a justice system plagued with stereotypes that are weaved into policing practices and contribute to the disproportionate incarceration of people of color; which results in the degradation of families and communities in those populations. Racial profiling is a persistent concern, and, police department leadership is an influential factor in how laws are enforced. There is little evidence to suggest that blacks or Latinos need to be stopped by police any more frequently than their white brethren but if head brass at the police department encourage you to look out for “red cars” then my guess is the frequency of “red cars” being pulled over is going to increase exponentially. 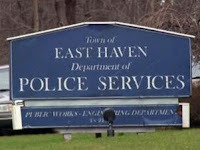 As evidence of this, the Jerome N. Frank Legal Services Organization at the Yale University Law School working with the Statlab at Yale University Social Science Research did an analysis of traffic ticketing in East New Haven and found a gross disproportionate enforcement against Hispanics. The report found that 56.3 percent of tickets issued were issued to Hispanic drivers. This is in a town where the Hispanic population is 5.8 percent. Pick your jaw up. The effects of Chief Gallo’s irresponsibility are not just felt in the backseat of a squad car. These are real lives that have been destroyed. The people targeted have families that they must provide for but their lives have disrupted and turned upside down simply because they were targeted. Imagine if you were that target. The collateral consequences of an arrest and conviction can lead to everything from civil state penalties, loss of voting rights, deportation, eviction and loss of employment to name a few. As result, just one night in jail as a result of being pulled over and arrested by Chief Gallo or his cohorts can lead to barriers to employment and housing in the form of a criminal record. By targeting and arresting people of color, not only are we continuing down the path of over-incarceration as a nation, but some law enforcement offices are signaling to the public are perpetuating damaging stereotypes about communities of color that those are your criminal. Not only does an irresponsible culture of profiling put a burden on the state in terms of the cost of incarcerating and monitoring people, but it feeds a damaging stereotype that percolates in the form of more aggression against people of color which inevitably will result in further exposure to the justice system. Keith Wallington is the Project Manager at the Justice Policy Institute.